You'll discover tucked-away gems like Altstadt Luzern and Museum of Art (Kunsthaus Zurich). The adventure continues: appreciate the extensive heritage of Old Town (Altstadt), contemplate the waterfront views at Lake Zurich, take an in-depth tour of Swiss National Museum, and pause for some serene contemplation at Grossmunster. For where to stay, photos, other places to visit, and tourist information, use the Zurich day trip planning website . Sao Paulo, Brazil to Zurich is an approximately 15.5-hour flight. You can also do a combination of flight, shuttle, and train; or do a combination of bus and flight. The time zone difference moving from Brasilia Time (BRT) to Central European Time (CET) is 4 hours. Prepare for cooler weather when traveling from Sao Paulo in January: high temperatures in Zurich hover around 5°C and lows are around -1°C. 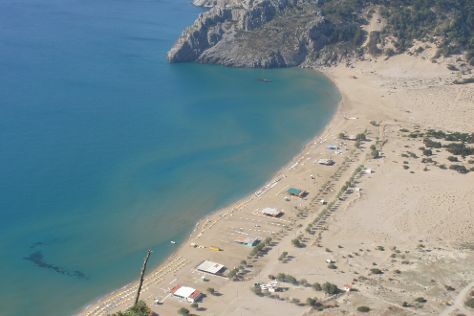 Wrap up your sightseeing on the 4th (Sat) to allow time to travel to Rethymnon. 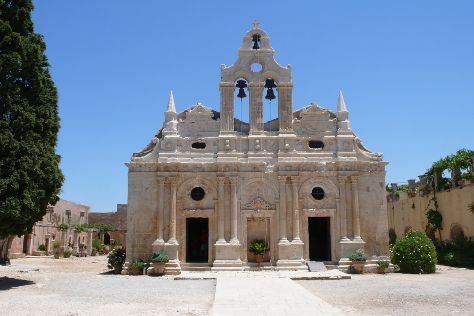 On the 5th (Sun), look for gifts at mariannas, don't miss a visit to Monastery of Arkadi, and then contemplate in the serene atmosphere at The Monastery Arsaniou. Keep things going the next day: soothe aching muscles at some of the top local wellness centers, then learn about winemaking at Klados Winery, then pause for some serene contemplation at Four Martyrs Church, and finally make a trip to Symbol of Rethymnon City. To find ratings, more things to do, photos, and more tourist information, read Rethymnon road trip planning app . Traveling by flight from Zurich to Rethymnon takes 6.5 hours. Alternatively, you can do a combination of flight and shuttle; or do a combination of train, bus, and flight. The time zone changes from Central European Time to Eastern European Time, which is usually a 1 hour difference. Expect somewhat warmer temperatures when traveling from Zurich in January; daily highs in Rethymnon reach 16°C and lows reach 8°C. Finish your sightseeing early on the 6th (Mon) to allow enough time to travel to Rhodes Town. Eschew the tourist crowds and head to Throne of Helios and Rhodes Toy Museum. Explore Rhodes Town's surroundings by going to Kolimbia (Monastery Tsambika & Artistic Village Contemporary Art - Art gallery & Museum of Ceramic Art), Ebonas Winecellar (in Embonas) and Kounaki Wines (in Ebonas). There's still lots to do: take an in-depth tour of Archaeological Museum of Rhodes (Hospital of the Knights), tour the pleasant surroundings at Tsambika Beach, enjoy the sand and surf at Agathi Beach, and take in the spiritual surroundings of Saint Nectarios Church. For more things to do, other places to visit, photos, and tourist information, refer to the Rhodes Town online trip itinerary planner . You can do a combination of shuttle and flight from Rethymnon to Rhodes Town in 4 hours. Alternatively, you can do a combination of car and ferry. In January, daytime highs in Rhodes Town are 17°C, while nighttime lows are 11°C. Wrap up your sightseeing on the 10th (Fri) to allow time to travel to Vienna. Vienna is known for museums, parks, historic sites, nightlife, and zoos & aquariums. Your plan includes some of its best attractions: wander the streets of Historic Center of Vienna, admire the striking features of Rathaus, explore the world behind art at Kunsthistorisches Museum Wien, and hunt for treasures at Vienna Naschmarkt. For ratings, maps, other places to visit, and tourist information, use the Vienna day trip planning website . You can fly from Rhodes Town to Vienna in 6 hours. Alternatively, you can do a combination of flight and train; or do a combination of ferry and car. Due to the time zone difference, you'll gain 1 hour traveling from Rhodes Town to Vienna. Traveling from Rhodes Town in January, expect Vienna to be colder, temps between 3°C and -3°C. Wrap up your sightseeing on the 14th (Tue) to allow time to travel back home.